My first (and only) Cricut was a Birthday present from my mom and dad (it's an Expression) over 3 years ago!! I had watched the Cricut infomercial at least 1000 times at their house (driving everyone crazy by making the 'chirping' Cricut noise -- at least they were sure it was a gift I would love)!! When I used my Cricut the first time, I d-e-s-t-r-o-y-e-d the paper I tried to cut and was terrified to use it again (for months!)!! I have since absorbed every bit of info I could/can find on the Cricut and I now regularly teach classes to others who want to learn more about getting the most out of their Cricut!! My Cricut really is my therapist -- If I'm having a bad day, I spend a little time making something, and I feel so much better!! You deserve it, thanks so much for passing it on!! Oh Amy thank you. You are too sweet! 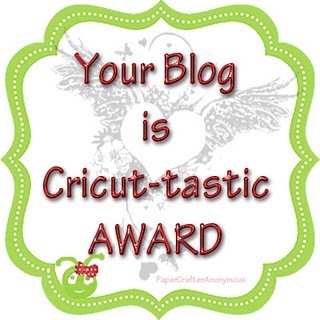 (I had to say Yay, I finally won something "cricut-y" when I saw this.) Thanks for honoring me with it. Now how many times have I been to your blog and I'm just now seeing that you have a FB page?! I mean REALLY!....I'm observant aren't I? Look out I comin' to find you over there so I can pester you some more. Oh this award is sooo you. Your blog is wonderful Cricut inspiration after inspiration. Congrats on your award- and thanks for passing it on!! Congrats on your award and for gining it to me! You are so sweet! Thank you. Congratulatios on your award! Thank-you for joining us at RAK, Please add me to your friends list on facebook so i may add you to the RAK group! Congratulations on your award - and thanks so much for thinking of me! It was fun to read a bit more about you. I'm glad you finally tried your Cricut again and didn't let a project gone wrong prevent you from learning all you could!